Black And Decker steam cleaner reviews and tips for making the most out of your Steambuster. The History of the brand Black & Decker started with two young entrepreneurs, S. Duncan Black and Alonzo G. Decker who founded the company in Baltimore, Maryland as a small machine store. Today, the company has grown to become a top producer of products used in both the home and industrially. The reach of their products extend far into the reaches of over 100 countries where lies the majority of their market. The company produces mainly a wide variety of household appliances and power tools. This is truly a multi purpose steamer in that it can not only be used as a mop but also as a general hand held steamer and clothing steamer. 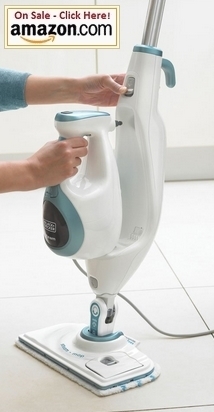 The steamer can be detached from the mop and used as a hand held steamer. Pressing the Steam Button will release a burst of up to 50% more steam to make dealing with tough stains easier when you need it. It uses Digital SmartSelect Technology that enables you to choose the type of floor you want to clean (wood/tile/stone) at the press of a button and the mop will automatically release the correct amount of steam for that floor type. The water heats up quickly and the indicator light will change from red to blue when the optimal temperature for steaming has been reached. If you like the scent of fresh lemon you will love using the scent tabs provided with the machine for a fresh clean aroma as you clean.